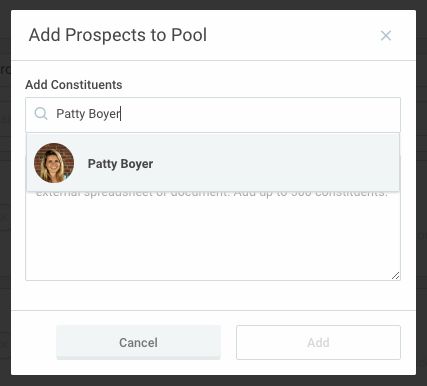 In order to add prospects to a volunteer pool, you can either import a set of prospects or manually add them using a pre-curated EverTrue list, searching by name, or entering a set of IDs or emails. If you choose the manual route, start by navigating to the pool that you want to add prospects to. Once you select your pool, on the right side you'll see a Prospects section where you can quickly add prospects and view any current prospects in that pool. Near the top right of that section you'll see an icon to add more people as prospects. Click here to open up a dropdown which lets you "Add Prospects" or "Add Prospects from a List." 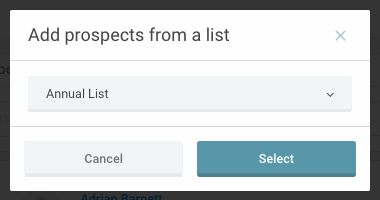 If you have an EverTrue List of the prospects you'd like to add, click "Add Prospect from a List" and you'll be prompted to select that this for a quick & easy add. 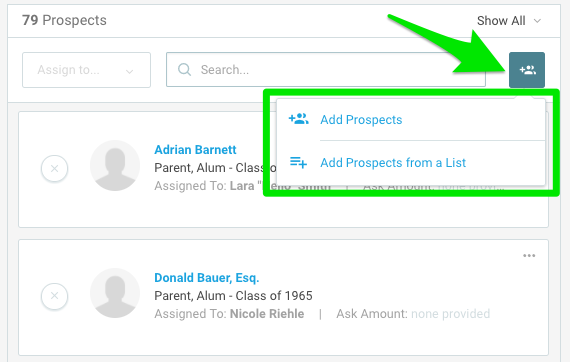 If you'd like to search by name or copy & paste a set of IDs or emails, click "Add Prospects" and choose your method. Once you have selected all of the constituents you would like to add as prospects, click "Add." 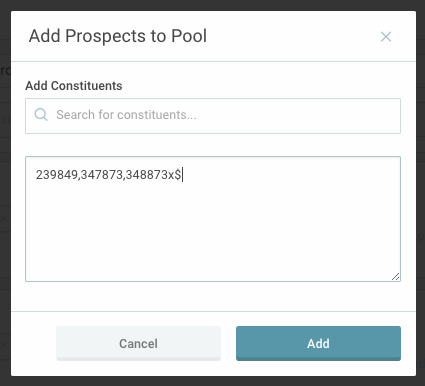 If successfully added, you'll see a brief green notice in the upper right corner indicating their addition and be taken back to the main pool screen where you'll now see those prospects listed. However, if any of the entered IDs or emails were not recognized, you'll see an additional pop-up notifying you and you can take further action from there. In order to import prospects into a pool, start by generating a CSV file using our Volunteer file format. This file can then be loaded in Console, similar to your main constituent file. However, please be aware that the volunteer file works much differently than our other file formats in that each row will not have a unique ID. If you are planning to add prospects to a pool using a file, please consult with genius@evertrue.com first to assist with proper ingestion. They will be able to ask you specific questions about your volunteer setup to help ensure that the prospects are added properly.